Toast to impressive tastes. These almonds are roasted and seasoned with a trifecta of garlic, chef-inspired spices and extra virgin olive oil to bring a distinctive crunch and burst of sophistication to any crostini or crudité platter. 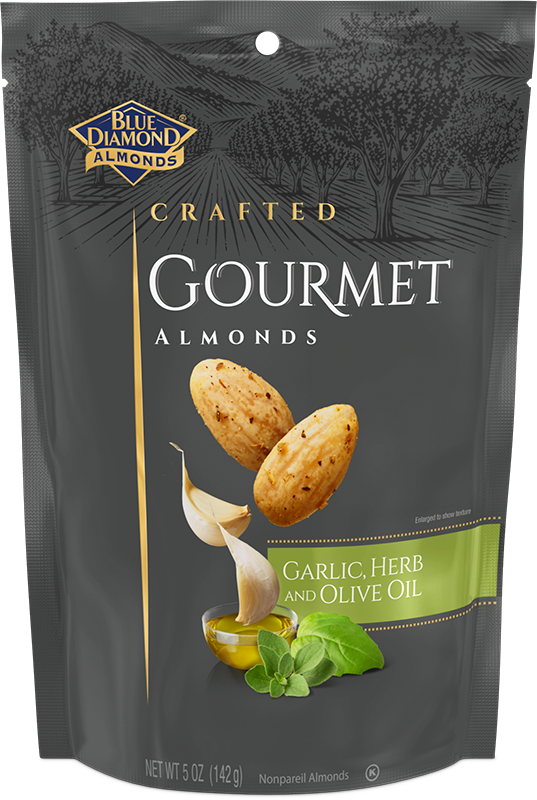 Get inspired with our Tale of Herbs & Sesame holiday gourmet pairing featuring Garlic, Herb, and Olive Oil almonds. ALMONDS, VEGETABLE OIL (CANOLA AND/OR SAFFLOWER), SEA SALT, ROASTED GARLIC, SPICES (OREGANO, BASIL, ROSEMARY), EXTRA VIRGIN OLIVE OIL.